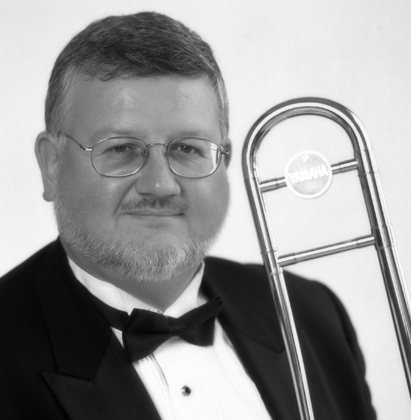 Alastair Kay, Head of Brass at Humber College, is busy as an arranger, composer, clinician, and as a virtuoso jazz and classical trombonist. His love of beautiful melodies started early in his teens, listening to great trombonists such as Urbie Green, Tommy Dorsey, Rob McConnell, Teddy Roderman, Frank Rosolino, and Ian McDougall. He has performed around the world with leading artists and entertainers such as Ella Fitzgerald, Rob McConnell, Diana Krall, Tony Bennett, Aretha Franklin, Paul Anka, Buddy Rich, Bill Holman, Nelson Riddle, Lionel Hampton, Peggy Lee, Frank Sinatra, and Andrea Bocelli. Al has appeared with Canada’s leading orchestras, and has toured with the orchestras of the Royal Winnipeg Ballet and the National Ballet. He has performed his own arrangements with the Hannaford Street Silver Band, Intrada Brass, the Weston Silver Band, Brassroots, the Orillia Concert Band and many others. In the recording studios, he has played on over a thousand radio and television jingles and soundtracks, and on numerous CD’s, records, and feature film soundtracks. Al is a regular around Toronto playing with the bands of John MacLeod, Roberto Occhipinti, Hilario Duran, and his own 5 and 10 trombone jazz ensembles. He has been first call for most of the musicals in Toronto for the past 30 years including Dirty Dancing, Lord Of The Rings, The Producers, Lion King, and Chicago. His association with Yamaha led him to Japan, helping design the YSL 697Z trombone, the Al Kay Artist Model mouthpiece, and performing with the Xeno Trombone Quartet. Al has websites at alkay.ca and torontobones.ca. He is also an avid photographer — you can see his work at www.alkayphotos.com.